New Client: Barrington’s Terra Vita, Inc.
We are proud to announce that Barrington’s Terra Vita, Inc. has selected Tinnelly Law Group as their association’s legal counsel. 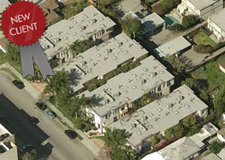 Terra Vita is a Mediterranean-style condominium association located in the Sawtelle neighborhood of West Los Angeles. Consisting of 16 spacious units, the community is a walker’s delight, conveniently located within a 15-minute walk to parks, recreation centers, and restaurants. Our HOA attorneys and staff look forward to working with Terra Vita’s Board and management.